Executive Director, Petra Pfeiffer, thanks Jeannie Blakely on Appreciation evening. Whenever there is a crime or tragedy, there is a victim. The word ‘victim’ does not adequately describe the complexity of circumstances that many of the people that have accessed Victim Services undergo. Victims are people who are impacted in the aftermath of a crime, accident, disaster or emergency. There are no set of boundaries identifying who can or cannot, be a victim; age, gender, ethnic background, rich or poor. All people are vulnerable. Being a victim is not a sign of weakness or a sign of defeat. Instead, a victim is undergoing a tragic event that limits a logical decision making process. Victim Services focuses on drawing on the strength and resiliency that that person possesses to help them with moving on and moving forward. 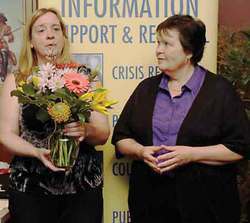 Wetaskiwin and District Victim Services provides the kind of support that people hope they never need, but are grateful for if they do. The services provided by Wetaskiwin and District Victim Services are as diverse as the victims themselves. But, although the services may vary, the goal of Victim Services always remains the same; to help restore stability and a sense of safety to people’s lives following a crime or tragedy. On April 10th, 2014 the staff, Board, Advocates, Family Violence Unit, RCMP and family members gathered to pay tribute to the volunteers who give so generously of their time and energy to help others. No one ever expects to need a program like Victim Services, but every year support is provided to hundreds of people with the volunteers logging up 13,000 volunteer hours of support annually. When on duty, the highly trained Volunteer Advocates, are on call twenty four hours a day, seven days a week (24/7) to respond to the needs of victims. RCMP Inspector Scot Tod brought greetings from the RCMP and stressed the importance they place on the partnership with Victim Services. He commented about how grateful the RCMP are to have Victim Services Staff and Advocates tending to the needs of the victims of crime or tragedy enabling the RCMP to focus on the crime or incident. Victim Services offers information for people on a variety of general topics related to the criminal justice system such as crime prevention, safety planning and legislation. Victim Services can provide or assist the victim's access to case-specific information which may include the status of the investigation, financial benefits, restitution, victim impact statements, and court dates. They connect victims with other community supports and provide referral services to other community resources, agencies and organizations. Victim Services Advocates are highly trained volunteers who listen, comfort and reassure victims. They provide crisis intervention, emotional support and practical assistance. Services may be short term or long term, beginning from the time of first response by the RCMP, to the final disposition of the case by the courts. Created and implemented an Investment Policy that will assist with financial sustainability of the Victim Services organization in the future. Recruited new Board members using a systematic process to ensure prospective Board members that are best suited to fill skills gaps. Worked with Executive Director, Jeannie Blakley leading up to her retirement to ensure a smooth succession plan.